After a couple of decades of yo-yo-ing between Stuart Smalley-like solemn earnestness and Dilbertish disdain towards all self-improvement literature and business books (two genres with very similar conventions, intellectual cultures and authorial intentions), I think I’ve developed a pretty good system for picking out the winners and weeding out the losers. Here’s my algorithm, with some fun examples of both good and bad. So how can you quickly filter out the losers and adopt a good-humored openness to being influenced by the rest? First, calibrate your expectations. There are no gospels and no pieces of utter garbage — if you have the patience, even the worst piece of dreck, read with an anthropologist’s eye, might yield some insight. Your filtration can, at best, be a threshold mechanism that will inevitably let some losers into your mind and let some winners get away. You want to pick a threshold criterion that minimizes both these kinds of errors and mostly lets in books that have a sufficiently high density of good stuff. Inevitably, your intellectual immune system will fail occasionally, and you’ll develop a severe bout of intellectual ‘flu due to a single bad idea leaking in. Take some Vitamin C, recover, and move on. Here is the decision rule: kick out any book that displays 3 or more of the tell-tale signs of shoddy thinking on this checklist. If you like more precision, rate your book on each attribute from 0-5 and throw out any book that crosses, say, a total of 10. Or best — consciously apply this filter for a few sessions of bookstore-browsing, and then let your subconscious take over the execution of this algorithm. Who am I? is an example of a godawful science-based book that stops at the science (and very dull science at that) and never leaps to the real world. The Millionaire Next Door fails fatally by being unable to make the leap from correlation to thoughtful analysis (see Fooled by Randomness for an incisive skewering of the premise of TMND). Mindless Eating: Why We Eat More Than We Think, on the other hand, is a great example of how to thoughtfully take good science into the real world by way of intelligent conjecture, in a way that educates and helps. Be careful though: since self-improvement sells more than popular science, very good popular science books are often marketed and packaged as bad self-improvement books, with a tacked on prescriptive chapter that the authors often don’t believe in themselves. An example is Why Zebras Don’t Get Ulcers, a book that is great pop science, but bad self-improvement. Read such books as pop-science. 2. Over-extended Metaphorism/Analogism: Your life isn’t isn’t golf or football; your business isn’t war. Yet self-improvement and business books insist on taking metaphors and analogies much too far. The result is that you either apply flawed analogical reasoning and fail, or fail to translate prescriptions to your situation altogether because of the obscurity of the translation required. The Power of Full Engagement carries the “life is a series of sprints, not a marathon” analogy much too far. It is a valuable analogy, but the authors clearly didn’t think too hard about where it stops applying. Overachievement draws an analogy between sports and advanced surgery to everything else, adds a conceptual distinction between “training” and “performance” mindsets, and then derails. While it has other flaws, the parable-format Who Moved My Cheese? pushes the metaphor just as far as it will go. Rules for Renegades which I browsed recently, is a good example of an offender (I could be wrong, but I find women writers succumbing to anecdotalism more often then men). Two books I reviewed on this site, Competing on Analytics, and Wikinomics, both make thoughtful use of well-chosen anecdotes, as is the beautifully written How Doctors Think . Another excellent example is The 48 Laws of Power, which I talked about briefly in my post, The 15 Laws of Meeting Power. 4. Motivationalism: To excite a reader for an hour is much easier than to actually change behavior. Motivational writing has its place, and books that are openly meant to motivate don’t worry me — The Alchemist is a good example. It is motivational writing masquerading as pragmatic, implementable self-improvement or business advice that is dangerous. 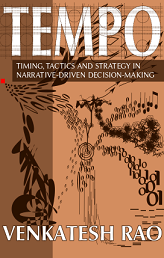 Such books typically set up a superficially plausible conceptual model — a just-so story — and then proceed to bury the logos of the rhetoric in so much ethos and pathos that during the entire reading experience, you are feeling too excited, emotional, noble or guilty to actually process the argument critically. The vastly over-rated The 7 Habits of Highly Effective People is the most egregious offender here. I am not alone in never actually having found much use for what I thought I learned. Getting Things Done: The Art of Stress-Free Productivity on the other hand, is a tasteful blend of effective advice with just the right amount of motivational prose to keep you engaged. Not only did I get excited when I read the thing, I actually successfully applied the concepts to my work. 5. Unreconstructed Autobiography-ism: This failure often accompanies Anecdotalism. Successful people (and companies) are possibly the worst authors of self-improvement (or “how to run a company well”) books. Few have a good-humored detachment from their own success, resistance towards confirmation bias or a keen sense of the role of luck in their own success. The result is that we get a reading of the facts of their lives that no critical biography-writer would have produced. Again, I don’t mind flat-out biographies, like say that old favorite, Iacocca . It is autobiography badly extrapolated into advice for others that is grounds for filtration. The best example I can point you to, of thoughtfully reconstructed autobiographically-based prescriptive writing, is not a book, but Richard Hamming’s excellent speech, You and Your Research. How Doctors Think is also a good example. Blue Ocean Strategy which I skewered elsewhere in this blog for incredible conceptual weakness, is a good example of this failure mode. Clockspeed, which is otherwise pretty good, is a lesser, more forgivable offender. Again, Getting Things Done: The Art of Stress-Free Productivity is an example of the right amount of conceptual scaffolding, as are Henry Chesbrough’s books on Open Innovation. You’d think there’d be a failure mode on the other end of this spectrum — conceptual bloat without enough empirical content. But fortunately, authors seem to be alive to this weakness and few books with this flaw make it anyway (some of my own blog posts, I admit, do tend towards this failure mode). 7. Dishonest Mysticism: This is sometimes hard to tell apart from motivationalism, but the key is that instead of attempting to over-inspire, fake Gurus attempt to over-awe. Parables, heavily right-brained books, and the like are susceptible. Genuine mystic literature and subjective reports of experiences the reader may not be able to replicate are fine by me. Where dishonesty begins is where the authors attempt to attribute authority to themselves based on those self-reported experiences, and use that authority to force dodgy metaphysics down your throat with florid rhetoric and cheap emotional tricks. The Celestine Prophecy is a major offender, as is the recent The Secret . Blogger Steve Pavlina, online self-development uber-Guru, often slides into this mode, though he occasionally has moments of pragmatic brilliance. Books that are in the danger zone, but gracefully and lightly carry their mystical elements without forcing them on you (and adding value whether or not you buy the mystical bits) include The Alchemist and A Whole New Mind. 8. Universalism: No theory or prescription applies to everybody. Period. Very few self-improvement or business books take the trouble to suggest to the reader how to evaluate whether the prescription might work for them, and what is and is not within their control. Outlines of substantive necessary or sufficient conditions for meaningful application of the concepts being sold is something I have never seen. At best you get some lip-service of the “of course, you’ll have to apply these ideas appropriately to your situation” variety. Let me eat my own dog food here and avoid Universalism. There are two conditions under which this algorithm will not work. The first is unique individual conditions. A book that is a “No” by any reasonable filter might still be the one that is the exact right stimulus for you, in your particular situation, to get you to a breakthrough. Which is why it is a good thing that the algorithm naturally fails occasionally, exposing you ideas you might otherwise have tossed. If you are in a very abnormal life situation, you might want to throw away this algorithm for a while. The second I’ll just call ‘magic’ — a book could be a failure by ALL these criteria, and STILL somehow come together coherently to be a masterpiece. I haven’t yet seen one, but that doesn’t mean it doesn’t exist. My filter is after all, just a heuristic, not an axiomatic theory. Endnote: Should You Deliberately Read Bad Books? Surprisingly, yes. Occasionally, bad books will be wildly successful. People around you will quote, use, and apply the ideas in such books. Mere blocking and filtration isn’t enough to protect you from such bad ideas. You will need to actively and critically read and energetically destroy the book for yourself and those you hope to influence. Vaccination so to speak, with the virus-weakening being achieved by your deliberately critical intent. So dare to be a critic. And don’t forget, sometimes books can be so bad they are just fun to read and tear apart. 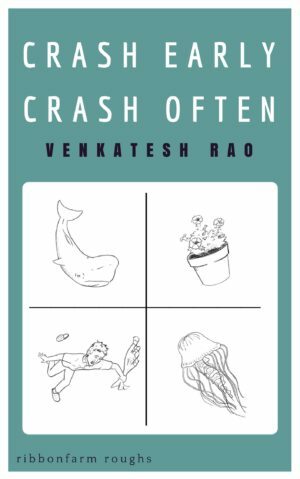 Venkat, nice one, makes me want to read a few of the books you mention. I’ve read very few of such books, not really to learn from them as much as finding them interesting. Among your list, I’ve read (rather, skimmed thru) GTD and I agree with you: although I’m too lazy to actually use it, it made a lot of sense (my fav is the one where he says if it takes less than 5 min, do it now: it is simple to follow, has a good rationale — it will take more time to plan it than to do it — and it actually works). There is this GTD wiki which I meant to try, but never did. Another good book I’ve read is Good to Great, or Built to Last; it’s the same author but I dont remember which is which. It’s the one in which he talks about great bosses, and the difference between level 4 and level 5 leaders, which is really interesting. Re 7 habits, I remember everyone in India seemed to have it. I’ve never been able to read it! And even that book, brilliant as it is, did not make me a considerably better problem solver. Probably this is true of any self-improvement book. The only difference may be that unlike in the case of books which claim to improve something that cannot be measured or even defined clearly, one’s math problem-solving ability can be measured fairly accurately and repeatably. I think you’re restricting your scope by reviewing books which actually exist – why not take a Borgesian leap and review books which don’t? If you got a lot of enquiries about a particular fictitious book… write it. Demand paging, as it were. I have another idea: this title would make a perfect fake book jacket. (google for some nice examples). Sell it in your online store. Secretly unload it in bookstores near the motivational section area, hijacking some unsuspecting book to carry your viral marketing. This is a great guide for choosing business and self improvement books. I like anecdotes a lot, reading self improvement books gave me a more positive outlook in life. Do you know about the Young Entrepreneur Society from the http://www.YoungEntrepreneurSociety.com? Learn from carreers of successful entrepreneurs. Pretty nice post. I just stumbled upon your weblog and wanted to mention that I’ve truly enjoyed browsing your blog posts. In any case I’ll be subscribing to your feed and I’m hoping you write once more very soon!